Recognize and visualize transformations of 2D shapes. 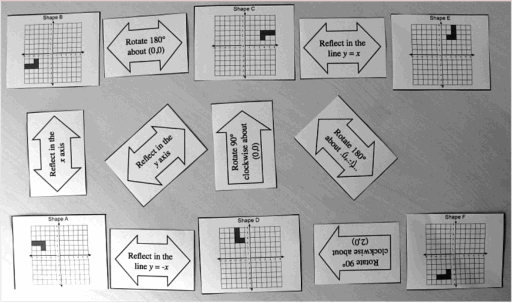 Translate, reflect and rotate shapes, and combine these transformations. It also aims to encourage discussion on some common misconceptions about transformations. Before the lesson, students work individually on an assessment task that is designed to reveal their current understandings and difficulties. You then review their work, and create questions for students to consider in order to improve their solutions. After a whole-class introduction, students work in small groups on a collaborative task. In a whole-class discussion, students review the main mathematical concepts of the lesson. Students return to their original task, and try to improve their own responses. Each student will need two copies of the assessment task, Transformations, one copy of L- Shapes (printed on transparency film), and a map pin or thumbtack. Each small group of students will need one copy each of Card Set A: Shapes and Card Set B: Words (cut up before the lesson), a copy of the transparency Transformations (printed on transparency film), a mini-whiteboard, a pen, an eraser, a glue stick and a large sheet of poster paper (optional). You will need an overhead projector for demonstrating the transparencies to the whole class. For an extension activity you will need several copies of Card Set C: Additional Words, and several pairs of scissors. There are some projector resources to support discussion.